Four Seasons at Wall in Wall Township, New Jersey is an exquisite active adult community that welcomes residents aged 55 and better. World-class amenities, abundant outdoor recreation, and a finely crafted lifestyle has made Four Seasons at Wall a hit with active adults. Residents enjoy living in low-maintenance homes because it allows them to live life to the fullest within the community. Four Seasons at Wall offers an environment where it s easy to meet new friends and neighbors who share the same interests and hobbies. At Four Seasons at Wall, residents have the perfect blend of a community that caters to both socially mined and physically active residents. A welcoming clubhouse is the centerpiece of all activity at Four Seasons at Wall. Here, residents gather with new neighbors, mingle with old friends and workout in a fun and relaxing environment. This beautiful facility boasts an indoor and outdoor pool, fitness center, card room, billiards, and ballroom. Outside, residents of Four Seasons at Wall can get competitive on the tennis, bocce ball, shuffleboard, and horseshoe courts or enjoy scenic views in the gazebo. There are a number of real estate options for homebuyers at Four Seasons at Wall. Construction of the gated community began in 1997 and was completed in 1999 with 400 single-family homes. These beautifully designed homes range in size from around 1,500 to approximately 3,500 square feet and feature two to four bedrooms, two to four bathrooms, and a two-car garage. All homes have open floor plans with ample storage space. Some homes even boast a sunroom, private patio, fireplaces and cathedral ceilings. The community encourages the residents of Four Seasons at Wall to realize their full potential by promoting an active lifestyle. Whether you are looking to maintain a physically or socially active lifestyle, there is something for everyone at Four Seasons at Wall. There are multiple clubs and interest groups that include crafts, cards, book discussions, tennis, and shuffleboard. Four Seasons at Wall provides an electrifying environment and a booming hub of activities for its residents. 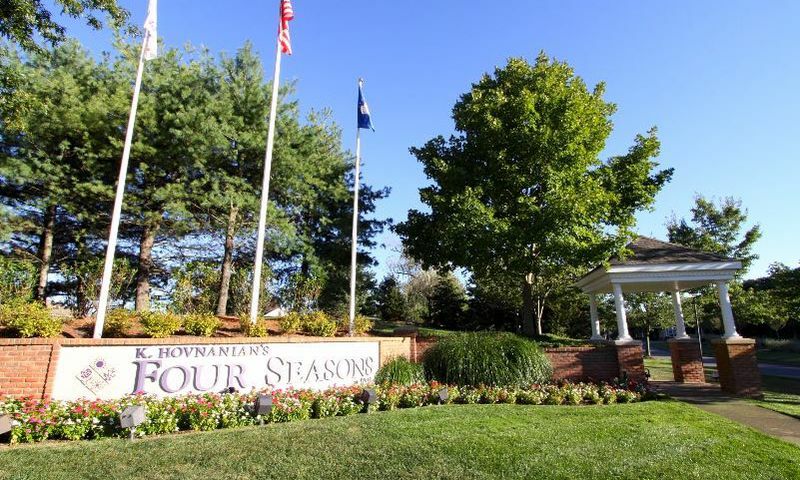 Four Seasons at Wall is located in Wall Township in desirable Monmouth County, New Jersey. Commuting is made easy with the Garden State Parkway and Interstate 195 a short drive away. In addition, residents can travel out of state with Philadelphia International Airport. The surrounding area is ideal for active adults. Popular attractions include the New Jersey Museum of Transportation, Allaire State Park, Meadowland Sport Arena and Liberty Science Center. Residents can explore the New Jersey lighthouses, take a bike tour around town, embrace the symphony orchestra, or play a game at one of the local golf courses. With its prime location, Four Seasons at Wall is a beautiful 55+ community that enjoys both an abundance of natural beauty and all the world-class dining, shopping and cultural attractions available in Central New Jersey. There are plenty of activities available in Four Seasons at Wall. Here is a sample of some of the clubs, activities and classes offered here. We've lived in our home here for 4 years and are very pleased with everything. The clubhouse is very nice, even the gym is elegant! I play a lot of tennis and we both are very active in the community. I love how quiet and private the community is and the location is great too. This past fall I really enjoyed the beautiful colors from the trees and took a lot of walks through the neighborhood with friends. It was lovely! 55places.com is not affiliated with the developer(s) or homeowners association of Four Seasons at Wall. The information you submit is distributed to a 55places.com Partner Agent, who is a licensed real estate agent. The information regarding Four Seasons at Wall has not been verified or approved by the developer or homeowners association. Please verify all information prior to purchasing. 55places.com is not responsible for any errors regarding the information displayed on this website.